A few months ago, I noticed that the two dogs were barking madly at a car parked in front of our house. After they had been brought inside, a juvenile mink, which had taken refuge in the undercarriage, jumped down and ran away (it looked just like a black stoat). I have also seen adult mink near by. 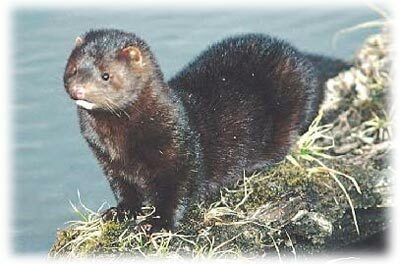 Recently, some idiots released 5,000 mink from a fur farm in Co. Donegal; this has potentially catastrophic consequences for local wildlife. Mink are gradually colonizing the country … there are calls for their eradication, but this would be difficult and expensive (estimated at over €1 million for an area of just 800 km2). It seems to me that mink farming should never have been allowed here, as these extremely aggressive and robust creatures were bound, sooner or later, to get free and pose a threat to ecosystems. Time for a bounty, perhaps … let the gun clubs show that shooting dopey pheasant isn’t all they’re good for. At least you can make a coat out of mink. Hard to make a coat out of rhododendren petals. There is flood immigration and flood immigration, innit. Brendano. I have just read your rather silly remark on MyT about Muslims having been ‘released’ in parts of Ireland. Muslims are not animals. Beware of irony. Also rather silly of you to try to compare a few thousand Muslims in Ireland to the millions of Muslims in places like France and Britain. The most westerly mosque – why not indeed, but why make it a form of crowing? Crowing about what? I was echoing tariqkhan’s term, Cymbeline. The post, like this one, is about mink, not Muslims. My comment there consists of facts … not crowing, and not comparison. Just facts. Beats me why you think it is fine to follow a caricature like Tariq Khan, when you disapprove of other sorts of caricature. I don’t follow him, or anyone else. And I am not your keeper. You never responded satisfactorily to the comment I made concerning the Muslim flood relief in Ireland. You quoted the Muslim spokesman who said that it was perfectly normal for the Muslims in Ireland to collect money for the stricken Irish, as the Irish had funded Muslim causes in Muslim countries. You quoted this statement approvingly. Patting on backs all around. I wondered why the Muslims in Ireland needed that sort of twisted logic to help Ireland. You do not see this sort of ‘them’ and ‘us’ attitude when it suits you. Patting of backs is better than stabbing of backs, Cymbeline. It’s one of the things that make the world go round. I don’t see why I’m expected to perceive a problem where none exists. Yes, perhaps taking the money was more important than thinking about the reasoning behind the collection. I would say that the money was given and received in a good spirit. When there is such a torrent of anti-Muslim material in the media and online, I don’t blame the Muslim community for drawing attention to its good works, and for pointing to the fact that Muslims don’t have horns on their heads. I don’t suppose that there is much anti-Western material in the media and online. I think that you should find a ranting Islamist site, and express your views there. Such sites abound, and places like MyT look like the Brownies in comparison. Lar as Brown Owl. Have a shufti, and think about the middle way. It doesn’t sound like fun. If blogging isn’t fun, I won’t do it. You’ll remember that I said that before. Problem is that all you are REALLY interested in is bulldozing what you see as old-fashioned British imperialism. You are trying to bulldoze what does not exist. The closest to what you think exists is the resurrection of British pride in certain values when compared to obscurantism and imported tribalism. I thought I was trying to point to the dangers that mink pose to our wildlife, Cymbeline. I think you hit the target sometimes with these observations, and did last night (?) with your ‘just desserts’ comment. You are correct and perceptive in that regard, I think. But you also fire a lot of arrows that miss the target badly. Those arrows perhaps say more about your preoccupations than about mine. Yes, of course. Of course I can be the object of other people’s perceptions too. And of course those perceptions can be true. You say that I may have been right about the ‘just dessertishness’. To me, the just dessertish idea goes hand-in-hand with what I see as your bulldozing of imperialist British attitudes that no longer exist. You are a bit of a Don Quixote in that respect. Perhaps I am. I don’t mind. He at least was harmless. I think vestiges of old-fashioned British imperialist attitudes do exist. I don’t think I pay a great deal of attention to them, but you seem to think I do. I don’t know. Typical of farmer to let wildlife go. Here in OZ we have huge problems with that sort of practice, eg. Deer farming that was the next “big money” earner and never made a dollar. You guessed it, Bamby’s all over the place. Where is Larry when you really need him. Actually, come to think of it, this country is overrun with pests that the British brought out with them. Foxes, Rabbits, Camels and all types of plants that cover the countryside. You are starting to sound like a Maggie mini me minus the trivial edge. And why shouldn’t he. My T is full of characters that have lived for good old British imperialism. It was the British way for ages, precious little island, and don’t think that the political correctness as preached by Blair and co. got rid of that. In all probability it made it worst. Rainer. I try to fight against the feeling that you are shallow. Keep fighting it. After a 12 hour shift and a weight loss program that has me drinking green tea instead of beer I can be as shallow as I want to be. Its a free world after all ! I prefer the term slightly overweight, a bit podgy or cute little love handles. But even as I blog and munch away on carrots and gherkins I am ready to get back to my original Sean Connery physique. You are right again my friend. Great actor, a body adored by the female world, but a pig of a man. I’m trying to drink as little alcohol as possible, for health reasons. Won’t drink any this weekend. Must save myself for Munich. Hello Rainer. I doubt the farmer was to blame, but you never know. Rabbits were brought here by the Normans. Myxomatosis was brought here from Australia … the actual diseased piece of rabbit arrived on my mother’s desk in the post when she was working for a farming newspaper. As a child, in the Natural History Museum in Dublin, I saw a stuffed muskrat that had been killed at a river near my home in the 1930s or so. Some fool had imported a pair of muskrats, which bred like wildfire and undermined the riverbanks. Luckily they were exterminated. The worst pest we have here in the moment is the Cane Toad. This frog was brought here in the fifties in order to eat beetles that feed on sugar cane. The Brainiacs that brought it here didn’t realise it doesn’t feed on beetles. Figure that one out. Notorious hard to kill, it is by now marching its way all across Australia doing tremendous damage to the native population. And nothing is out there that would want to eat it as it is poisonous. Yes, I watched a shocking documentary about it a couple of years ago. Alien species can do enormous harm. The zebra mussel is also a problem in Ireland. Amicus never told us about the walking catfish. That catfish caught my imagination. I wonder if it is still walking, or if it has reached its destination. I know that it caught your imagination. It caught mine too. Amicus seems to have abandoned MyT, along with many others … including yourself. I keep an eye on your antics there, though. I don’t think I’ve ever been called a harpie before. I was calling myself a harpie. When I mentioned Amicus’ comment about Ireland returning to the fold, I did not mean it as an insult to Irish history. I was not even thinking of politics and war. I spoke of Ireland being part of my cultural references because one of my grandmother’s brothers married an Irishwoman, my sister had an Irish boyfriend, my ‘lower-your-voice-to-a-scream teacher was Irish, I studied ‘Waiting for Godot’ for A level, whenever I took the Holyhead train in London, there were Irishmen who shared the journey and their sandwiches with me, I was a student in Spain with Irish students, I was at university with an Irish boy who stunned us all because he arrived in a chauffeur-driven car etc etc. I understood that, Cymbeline. That’s all good. But in Amicus’ image, and in his mind I would say, there is a sense of Britain as mother hen with its wayward clutch under its wings … this is why the idea of Ireland rejoining the Commonwealth, never mind the UK, would make me slightly queasy. The EU is the thing. No. Amicus would not have meant it like that. Again, you are pitting yourself against attitudes that no longer exist. Our perceptions are different. Do you remember a MyT blogger called Atrium? He held very definite and explicit British imperialist attitudes. He was very anti-Irish. It is a sort of British humour. The British ‘rant’ has always eluded you. No, it was the diametrical opposite of humour. Rants can be humorous, but they are not invariably so. How could he be called an imperialist? He was not asking for the British Empire to be re-instated. And you recognize the insanity of PC Britain. Thank God for the ranters. Do you read The Spectator? I’m just cooking dinner and doing a few things … talk to you later. Good morning Brendano. Have read this blog on My T and of course here as well. It is interesting how many things on blogs end up being about Muslims 🙂 Thank you for your continued fairness in discussing the issue of Islam. Hello Cymbeline, hope you are well. I have read your exchange with Brendano here with rapt attention but do not feel I can add anything now that I have not already said elsewhere. Good morning, Shermeen … nice to see you. You don’t seem to be on MyT much these days. It has deteriorated badly. Cymbeline does seem to be somewhat preoccupied with what she sees as the threat posed by Islam. Hello Shermeen. Anything you say is interesting as far as I am concerned. Selfishly, I wish that you would add more. I hope that you are well too. I often think about how sad you must feel concerning the present state of the country of your birth. And those drone attacks chill me to the bone. Brendano – ‘certain aspects of Islam’, please. Homework for Cymbeline. Visit a masjid. Jeez, the whole debate drives me nuts, the blogging world at its worst ! I recently talked with an officer that worked with the Australian Federal Police in its anti terrorism squad. He reckoned that 99 per cent of Muslim migrants were peaceful people that just wanted to live a normal life and appreciated the new society they lived in. He, and his work mates, were very active to find and observe the one per cent, and I fully trust him and his department to keep me safe. Naturally someone may slip through the net, something to worry about, but do I stop driving because thousands of people die in accidents each year? Therefore the whole terrorism threat is overrated. What we and especially Cymbeline is talking about is the issue of new migrants fitting into another country. But for crying out loud, this has always been the same and the solution comes with their offspring and years of living in a new society. What compounds the problem is sheer numbers of immigration these days and the outspokenness of these migrants. Stop the hysteria and learn to live with one another. What worries me more, being bearish, is the near collapse of the western capitalist system. Usually in this event public spending contains the damage, but this time around the governments have given all their money to the banks so there is nothing left. Guess what the other solution, in this event, will be. The ground is set and I hope to God that I am terribly wrong in my assessment. I would like to visit a mosque, Mr Broxted. Trouble is that as a woman and a non-Muslim, I would not be able to do so properly. I would also like to visit Mecca – but I am not allowed to do that either. My wife and I were in mosques in Istanbul, but perhaps not properly. Were you able to sit in on a religious service? Did you visit Hagia Sofia? That is a museum, of course. I don’t remember any religious service. We were in the Hagia Sofia and the Blue Mosque, as I recall. I believe one has to pay to visit the Hagia Sofia. My father had to, a few years ago. He felt like saying, ‘but this is a church, mate, and I am a Christian.’ He didn’t say that of course. He paid his money and went in for a look. Of course. One thinks of the story of Nobby and the Frenchman. Can’t quite see the parallel. You thought you were in a mosque. My father knew that he was in a museum and thought about the building’s Christian past (was he allowed to do that?). Nobby thought that he was in a church, and he was in a church. I know. But it unaccountably made me think of Nobby and the Frenchman. C’est la vie. Be careful. Nobby might post his great literary oeuvre for the tenth time. Thanks for that, Rainer. I think there are various threats to our way of life, but they are often overstated. Certainly if the powers that be don’t address them properly, or at all, they ought to be criticized. Here, the economic threat is the main one, as the country finds itself massively in debt due to the antics of bankers. Yet the sun still rises, most people go about their business and do their work as usual, and there is little sign of panic or despondency. In our local town, next weekend’s Pumpkin Festival will no doubt be a great success and everyone will have a good time. I think our way of life is pretty resilient. No doubt it is. Especially in rural Ireland, with due respect, the big time of the financial upturn didn’t make that much difference, and yes, by the end of the day people still have to eat and brush their teeth. It made a difference in that a lot of houses were built and a lot of money was floating about (not that a huge amount floated in my door). Some people built mansions and can’t now afford the mortgage, but we’ve been on the property ladder since 1992 and don’t have a big mortgage, luckily. My wife and I are both working … things are not bad. According to The Economist, Kerry Group is doing all right. 6.7% growth in sales and 12.9% growth in trading profit in the first half of the year compared to the same period in 2009. Yes, there are various success stories amid the gloom and doom. The UK dairy industry is largely owned by Irish companies such as Kerry, I think. According to the article, Kerry Group are doing OK because of their global reach. Not so Musgrave who rely on Irish and British consumers. If the article interests you, it is called ‘Irish companies. Riding the Tiger’. The Economist, October 9th. I do not see ‘threats to my way of life’. I simply see things that piss me off, and I mention them, so that they will never become threats to my way of life. Nothing wrong with pushing back when one feels pushed. I think that that is a way of avoiding open violence. I remember once talking to Shermeen about demands to put the Koran on the top shelf in public libraries. Because of my culture, I said that I did not like that sort of demand. I certainly would not ask for a public library to give pride of place to the Bible. Shermeen said that there was no harm in asking. I agreed. No harm in refusing to comply with the request either. Smiles all around. I remember that exchange of views, Cymbeline. Perfectly reasonable, and yes, smiles all round. Nice to see you, Araminta. Hello Araminta. I know that you like that sort of civilized exchange too. Hope you and Bilby are both fighting fit. Il ha’am d’ul il eh. Perhaps Belfast is fortunate our “big” masjid will let you. As for dow’ah (attending salat or prayer) they were okay with anyone I knew who asked. The ideal abalance, they do not shove it down your throat nor tell you to go Imshee. Glad to hear that there is at least one religiously tolerant establishment on the island of Ireland, Mr Broxted. Allah Akbar. May the Belfast masjid convert all the Irish to the religion of peace. Yes and they don’t kiddy fiddle. Oooh that was a low blow. As someone who always supported the underdog I ought to be backing the Vatican eh? I won’t be around much for a while. I’m sad to say that my son has died suddenly. Brendano, I am horrified to read this. You have my deepest sympathy. Brendano, either Haslam has plumbed new depths or … I shall contact you offline “Ron”. I’m really so very sorry to hear your news about your son. Please accept my sincere sympathies and condolences to you and your family. Again, I’m so very sorry, and my thoughts are with you. I’m so sorry to hear your sad and shocking news about your son. My condolences and sympathies to you and your family. Thinking of you. Thanks to everyone who has expressed sympathy. It has been a very strange day. My wife and daughter were in Italy, but are now home – I have been up and down to Dublin Aurport. We have lots of relatives and neighbours in the house. Cymbeline, you rang while I was out. Thank you. This news hit me like a bullet through the heart. My condolences and sympathy to you and your family. As always one is stuck for words of comfort in a situation like this, but for what its worth, your sons spirit will live on. Take care in these difficult times. Cathy and I shall light a candle for all of you tonight. Thanks very much, Rainer. We are lucky to have great neighbours and friends.